This is the part 1 of 3 in PHP CRUD tutorial. The main purpose of a CRUD grid is that enables users create/read/update/delete data. Normally data is stored in MySQL Database.PHP will be the server-side language that manipulates MySQL Database tables to give front-end users power to perform CRUD actions. As you can see, this is a very simple table for tracking customers' information (name, email address and mobile number). And we prefer an auto incremental primary key (id). Create a PHP file "database.php"; this file contains a PHP class named "Database". Throughout this application, Database handles all the stuff related to database connections, such as connecting and disconnecting. $dbName: Database name which you use to store 'customers' table. $dbHost: Database host, this is normally "localhost". __construct(): This is the constructor of class Database. Since it is a static class, initialization of this class is not allowed. To prevent misuse of the class, we use a "die" function to remind users. Here comes the grid without CRUD capabilities. Because CRUD operation can only be performed when there is a grid. We firstly need to build a grid. From there we can subsequently add "Create" page, "Read" page, "Update" page and finally "Delete" page. 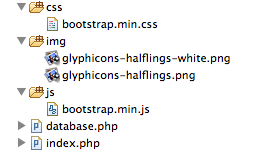 Head to Bootstrap official page, and download a copy. In this tutorial, we are using version 2.3.2. After that, create a PHP file "index.php". Then we include "database.php", create a PDO connection to database, and use a general "SELECT" statement to retrieve data. Lastly, we loop through each row to print content. Do not forget to close the connection as we mentioned at the beginning. The grid is empty because there is no actual data inside "customers" table, to test if it is actually working, you can manually insert data into "customers" table. It should show them on the grid. As this post is getting too long, let us move on to next post. In PHP CRUD tutorial part 2, we demonstrate how to create the "Create" and "Read" pages of PHP CRUD grid.